The system is complete, with a free standing control unit that delivers a perfect bi-amplified power match to the egg drive units, source select inputs, active analogue crossovers, LF and HF trim pot equalisation for room and location set-up compensation and a mid-band control to emulate the mid-range response of both Hi-Fi and NS10 type speakers. Above all, the sE Munro Egg 150 Monitoring System is designed to deliver the highest quality sound with the absolute minimum of coloration. In one word - Truth. The result is a breath-taking transparency that within seconds of listening reveals a much more defined and open mix, in which the whole balance simply ‘feels’ more complete. Of course certain aspects of some recordings may be shown up to be distorted or not as the engineer intended, but that is the truth, unobscured by colouration. A monitor that flatters to deceive has no place in a professional recording studio and there is no argument for using poor quality speakers to match inferior playback media. Well recorded material, translates to any medium, but the opposite is absolutely not true… if your monitors put a fake ‘sheen’ on everything, how will you ever know what your material sounds like on an honest system..? You may be embarrassed! There is also a good argument for a fully analogue monitor. The bandwidth and dynamics of a true analogue system will show up the character of the digital system preceding it. It also removes issues with bit rate conversion and other compatibility matters. By using high quality linear power supplies, the sE Egg system maintains maximum transient power up to double the rated value. Bi-amplification further enhances the power headroom and results in the lowest possible distortion values. By using 35V power rails the Egg is capable of high transient sound levels from a relatively modest amplifier compliment. 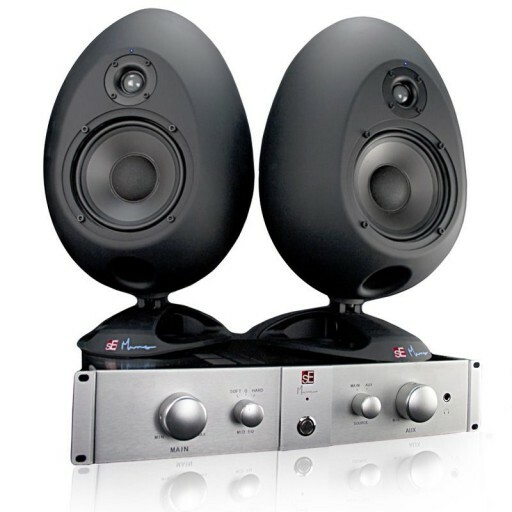 The sE Munro Egg 150 is the final product name of the "sE Munro Medium Egg Speaker" announced at Musikmesse and NAMM. The "150" refers to the approximate size of the driver. As more Egg Monitoring Systems are in development, it seemed foolish to term the first sE Munro speaker system as "medium" when it may not be in the fullness of time.